Actress Eva Longoria has endorsed spiritual teacher Marianne Williamson, one of more than a dozen candidates looking to succeed retiring Rep. Henry A. Waxman, D-Calif., in the 33rd District. “There is a problem in the political system right now. And I find that we have to approach solving this problem in a new way, in a conscious way, in a way that is going against the tide. I find Marianne has the tools, the capability, the intellect, the ideology that is going to push against the status quo,” Longoria said in a video endorsement released on Tuesday. Williamson is running as an Independent in this district, which spans the Los Angeles coastline, making it home to some of Hollywood’s biggest names. Other top-tier candidates include state Sen. Ted Lieu, former Los Angeles City Controller Wendy Greuel, both Democrats, and military veteran and Alpha Epsilon Pi Fraternity President Elan S. Carr. The top-two vote recipients in the June 3 primary, regardless of party, will advance to the general election. The former “Desperate Housewives” actress is no stranger to politics. Longoria served as a co-chair of President Barack Obama’s campaign in 2012. California’s 33rd District is rated a Safe Democrat contest by Rothenberg Political Report/Roll Call. Wednesday's Supreme Court ruling striking down limits on what wealthy donors can contribute to political campaigns overall drew a lot of hand-wringing from good government groups and some candidates. But at least one Republican operative saw the "McCutcheon ruling" as a boon for his party. It "will absolutely help” GOP candidates in House races because the limits had “kept a lot of donors from giving to all the races they might have liked to,” said Republican consultant Reed Galen. While the ruling did not eliminate the cap on an individual's contribution to a single candidate in a federal election, it erased the limit on how much wealthy donors can donate overall during an election cycle. Galen said the pools of wealthy Republicans, mainly in Orange County and the Los Angeles and Bay areas, "now can give to every campaign they might be interested in," a factor that can be especially important in late-starting campaigns. At least six congressional races in California are expected to be hotly contested by the major parties this year. They include two in the Sacramento/Central Valley region, two in the Inland Empire/Riverside County area and one each in Ventura and San Diego counties. John J. Pitney Jr., a Claremont McKenna College political scientist, said he doubts the ruling will be a “proverbial game changer” and would not have nearly the same impact as the earlier Citizens United decision. That 2010 ruling removed spending limits on groups who want to support candidates outside their campaigns. Still, Wednesday's ruling is important in some ways, including its potential to “strengthen the hand of party leaders,” Pitney said. Parties no longer will be limited in how many candidates they can support financially. Others decried the ruling as another blow to campaign finance laws, which are especially strict in California. Several candidates -- Democrats and one independent -- in contested House races issued news releases blasting the 5-4 decision, including some in the 18-candidate contest to succeed retiring Rep. Henry Waxman (D-Beverly Hills). Spiritual teacher and bestselling author Marianne Williamson, who is unaffiliated with a political party, and university teacher Kristie Holmes, among the lesser known of 10 Democrats in the 33rd Congressional District race, planned to attend a Wednesday evening protest rally. The rally was to be held in front of the federal building in Westwood. "Today is a dark day for America, as our Supreme Court has put one more nail in the coffin of our democracy," Williamson said in a statement released ahead of the rally, which was to include a news conference. Holmes in her statement said the court majority "continues to erode our nation's campaign finance laws that were enacted to protect political equality." LOS ANGELES, CA -- Today, Marianne Williamson’s campaign announced the endorsement of Eva Longoria, actor activist and philanthropist. Williamson expressed gratitude for Longoria’s endorsement. “Eva's support for my campaign is huge, and I thank her. She is everything I admire about the modern American woman --- accomplished, yet using her accomplishments to help improve the lives of others." Yo apoyo a Marianne Williamson por varias razones. Hay un problema en el sistema politico ahora. Creo que tenemos que llegar a resolver este problema de una manera nueva, de una manera consciente, de una manera contra corriente. Yo creo que Marriane tiene las herramientas, la capacidad, la inteligencia, y la ideología que va empujar contra el statu quo. Y por mi parte, yo pienso que eso es importante. Yo pienso que es maravilloso que se está presentando como candidata independiente. Yo pienso que es maravilloso que no quiere estar obligada a ese partido o el otro, o a una idea u otra. Ella realmente cree que el poder pertenece a la gente. Yo siempre digo que el parte más poderoso del proceso político es el ciudadano. Y ella se da cuenta de eso de una manera grande. No solamente de su experiencia como líder espiritual, como oradora motivador, o como alguien involucrada con varios tipos de comunidades--aunque sea la comunidad femenina, la comunidad minoritaria--yo encuentro que la gente puede identificarse con su mensaje porque realmente habla con el individuo. Y yo pienso que eso es lo que falta del sistema político, la individualidad de las voces de todos. Y ella va ser la persona que ayuda a elevar las voces para que sean escuchadas. LOS ANGELES, CA -- Today, Marianne Williamson’s campaign announced the endorsement of Van Jones, an environmental advocate, civil rights activist, and attorney. "In a world of cynical, transactional politics, Marianne Williamson stands out as a transformational leader," said Jones. "I support Marianne Williamson for Congress because her years of public compassion and courage uniquely qualify her to speak deep truths and move the needle -- even in the heart of Washington, DC. Her strength, courage and wisdom will bring the best out in other leaders. I support her passion for getting money out of politics so we can repair our democracy. I applaud her for challenging the status quo on such important issues as civil liberties, expanding corporate influence, domestic surveillance and high mass incarceration rates. But mainly I admire her for the impact her work and words have already had on so many people who are living better lives because of the insights her writing has elevated." It’s going to take a miracle to restore functionality to the U.S. Congress. Can Marianne Williamson, author and teacher of A Course in Miracles, help initiate it? Williamson has long been outspoken. She foundedProject Angel Food to feed homebound Angelenos with AIDS, and co-founded The Peace Alliance. She produced the Sister Giant conferences to support women and nonviolence, has written 10 books, and was pastor of her own church for five years. Williamson hopes to represent Los Angeles District 33. What I love about living in Los Angeles is the attitudes here—the way people are open to new things, new ideas, new people. I decided to run for Congress because I feel strongly that this is not a time to be silent—about America, the world or the fate of the human race. I think I have a good chance of prevailing over the incumbent because it’s time for a new conversation in America, and the political status quo will not be articulating it. The incumbent knows many things because he’s been in Congress for 38 years, but I know many things because I’ve not been. Where politics and spirituality intersect is in that place where moral authority trumps money, governmental power, technology or any other worldly force. Abolition emerged from the Quakers; the women’s suffrage movement emerged form the Quakers; the civil rights movement emerged from the Southern Christian Leadership council. Such movements didn’t come from political parties; they came from what Gandhi called the “soul force” of the American people. The way to bring love into politics is by making love the bottom line. By insisting that the love of our children, our democracy, our planet and our future take precedence over the efforts by a relatively few people to provide only for their own short-term economic gain. My biggest concern for the people in the district I hope to represent is that my campaign help awaken all of us not only to the rights, but also the responsibilities of citizenship. That not only their interests, but also their consciousness be represented in Washington. What excites me most about being in Congress is being part of the living history of the United States. Every generation of Americans is a steward of our democracy, and I would love the opportunity to contribute. 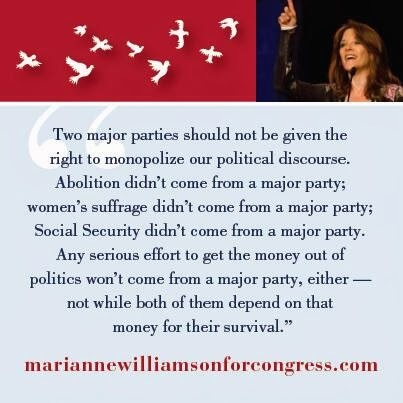 Please help support Marianne Williamson’s campaign! Los Angeles, CA – Today, Marianne Williamson’s campaign for Congress in CA-33 announced the endorsement of former Governor of Michigan Jennifer Granholm. "I have known Marianne for years and have witnessed the positive impact she's had on many lives,” Granholm said. “It's wonderful that she is running for Congress. She has tremendous talent and skill to bring to the country at large." “I'm grateful for Jennifer’s endorsement, as she represents many of the qualities I most admire in a political leader," says Williamson. "I've watched her combine steadiness and dignity with humanity and compassion both in and out of office, working tirelessly to make government do a better job at improving the lives of real people." Granholm became Michigan's first female Governor, serving from 2003-2011. She was also a member of President Obama's presidential transition team before he assumed office on January 20, 2009.She is a Distinguished Practitioner of Law and Public Policy at the University of California, Berkeley. With her husband Daniel Mulhern, she coauthored A Governor's Story: The Fight for Jobs and America's Future, released in September 2011. Former Congressman Dennis Kucinich and food safety activist Elizabeth Kucinich have endorsed Marianne Williamson for Congress, CA District 33. "Marianne is needed in Congress," said Dennis Kucinich. "She will stand for peace, civil liberties and sustainable policies on issues ranging from food to the economy." "Marianne is a 'Sister Giant' with a backbone. She is courageous, strong and knows her true north" said Elizabeth Kucinich, "Marianne is a woman whose leadership not only guides but inspires leadership in others. Who better to send to Congress?" "I'm honored to have the support from the Kuciniches as they represent the values my campaign is based on. I'm deeply grateful for their endorsement," said Williamson. Williamson will appear with Dennis and Elizabeth Kucinich as well as author John Robbins on Friday night, Feb. 28, at 7:30 PM at the Unitarian Universalist Church, 1260 18th St. in Santa Monica. The event is free to the public. Are North Carolina's Moral Mondays too far away for you to really get what they're about? Hint: they're not about anything Wendy Greuel will ever understand. Marianne Williamson isn't a political careerist. And political careerists-- and political careerists-in-the-making-- resent her for it. Many snicker that she's "just" a spiritual teacher or a guru of some kind, a put-down among political careerists. And how dare she not be in one of the two corruption-dominated parties that think they have a God-given monopoly on power in America! The first time I was ever arrested was at the first big New York City draft-card burning rally. It was the first day of the rest of my life. I worked very hard to wind up in a very special cell with Allen Ginsburg, Dr. Benjamin Spock, Tuli Kupferberg, Ed Sanders and other non-politicians who were very "spiritual" and who were beginning the process of moving the culture and dragging the politics along-- to end the War Against Vietnam. My hero at the time was another non-politician, who changed the country-- Dr. Martin Luther King. He was "just" a spiritual teacher too. If you live in the L.A. area and you haven't met Marianne Williamson, it's because you haven't the made the minimal effort it takes to do so. I've been working in congressional campaigns since the summer between my last year in high school and my first year in college-- Bill Ryan, then the only antiwar Congressman was my first-- and I have never seen a more open, more grassroots campaign than the independent race Marianne is waging from Rancho Palos Verdes through Redondo Beach, El Segundo, Venice, Santa Monica, Malibu, Brentwood, Beverly Hills, Westwood and out to Topanga, Calabasas and Agoura Hills. She's everywhere… all the time, speaking to small groups and large crowds, mostly to people who wouldn't be caught dead at a politician's event. Yesterday Diane Winston, who teaches at USC how metaphysical movements were pathways to female empowerment and social reform since the 19th century, covered Marianne's race for Religion Dispatches. She gets why Marianne's campaign doesn't have much to do with earnest liberal Ted Lieu or careerist hack Wendy Greuel or any of the assorted politicians eager for a cushy career in Washington. She notes that much of the coverage of Marianne's campaign sniggers at "her 'New Age teachings.' But few mentioned the social activism that had been a continuous thread through her career. That activism-- from the 1989 founding of Project Angel Food, which provided meals to people with AIDs to the 2012 launch of Sister Giant, an initiative supporting women’s engagement in electoral politics-- culminated in her announcement last fall that she would run for the California’s 33rd District Congressional seat." When Marianne lectured at her class at USC, she wasn't fully prepared for what she heard. Instead I heard a candidate raise the issues that worry me: economic inequity, climate change, rocketing incarceration rates, domestic surveillance and a permanent war economy. She explained that she is running as an independent because both Democrats and Republicans are so beholden to corporate funders that neither can instigate genuine reform. She believes that most Americans are disgusted by Washington’s obeisance to big business and expects they will start electing independents to get the country back on track. Yet as important as these issues are, Williamson’s appeal is not based on what she wants to do but on why she is doing it. Since the 1970s, she said, the American left has abandoned the spiritual impulse that fueled movements for abolition, labor reform, women’s rights, civil rights and pacifism. For Williamson the spiritual impulse, the “self-actualization of the individual,” leads to a life of love and a beloved community embodied by a society that seeks the best for its citizens and their planet. As she spoke I found I couldn't argue with her portrait of a left that has closed its ears to arguments about love’s transformative power and the immanent transcendence that betokens its presence. We-- especially those in academia and the media-- have written off religion as divisive, outmoded and irrelevant just as we have trivialized spirituality as frivolous self-indulgence. As a result, our politics are soulless and our candidates’ calls for hope fail to translate into change. Yet it’s not just the left that’s at fault. For several decades, the legacy media has conflated news about American religion with news about the Religious Right. And even when the media does write about religious moderates, it’s usually on denominational in-fighting over key issues on the right’s agenda (gay marriage, ordination of women and gays, and abortion). The disparity between what’s deemed newsworthy and what’s not would be comical, if it weren’t for the news media’s key role in framing public discourse. Why is it business-as-usual that Fred Phelps and a handful of anti-gay Westboro Baptist demonstrators receive widespread coverage while 80,000 protesters against North Carolina’s tax hikes for its poorest citizens amidst cuts to its education and healthcare budgets barely register in the nation’s news outlets. Simply put: religion news is dominated by the shudder-worthy antics of the extreme right while successful organizing by religious moderates, and political campaigns by spiritual activists, are mocked or ignored. Williamson may have thought she had a sympathetic audience among the students, but she failed to rouse their enthusiasm. Dilatory questioners asked about her connection to Judaism, her spiritual practices, and her take on metaphysical religion. Few seem ignited about her fusion of spirituality and politics much less her campaign for Congress. When I ended the class after a very long 80 minutes, she seemed troubled by their unresponsiveness. Maybe they were tired, I said. Perhaps they were intimidated. I did not say they may have been turned off by campaign riffs that worked for supporters but not the uninitiated. Those had not bothered me. I was too caught up by my own epiphany: I’d bought the media line. I, a leftist who studied religion, had spent 20 years thinking the worst of a woman-- she was out for money, played on her sexuality, exploited the lost-- because she believed something different from what I did. Marianne Williamson may have had me at hello, but she hooked me with her description of spiritual politics and her belief that the left can still be saved.